After a year of intensive work, Paddy’s archive is now available to the public at the National Library of Scotland. The inventory is 81 pages long and the list of Paddy’s correspondents is well over 1,000, with many many famous names including Gore Vidal, Truman Capote, Iris Murdoch, Lawrence Durrell, Bruce Chatwin, Cyril Connolly, the Duchess of Devonshire, Prince Charles and Paddy’s publisher John Murray. Future goals include digitising the most important material and to run some exhibitions. 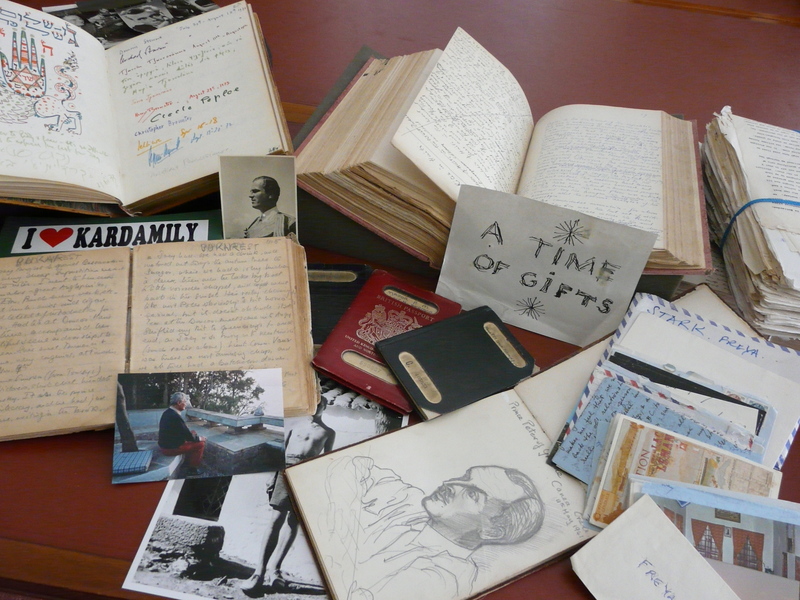 The archive of one of the most charismatic characters of the last century, Sir Patrick Leigh Fermor, is fully available to the public from today (Tuesday, November 18) after being catalogued by the National Library of Scotland. Sir Patrick, who was universally known as Paddy, was the finest travel writer of his generation and has been described as “a cross between Indiana Jones, Graham Greene and James Bond.” He was a decorated war hero, adventurer, scholar and Hollywood scriptwriter who could count princes and paupers among his friends. The archive, which arrived at the National Library in 2012, is vast, occupying some 16 metres of shelving. Its contents offer a journey through the 20th century in the company of some of its key figures. The inventory alone runs to 81 pages and lists extensive correspondence from fans, friends and associates; literary manuscripts, often with numerous annotations and revisions; diaries; notebooks, passports; sketches; photographs; articles and research papers. One of the star items is the only surviving notebook from his youthful trek across Europe which began in 1933 and provided the source material for his most famous books A Time of Gifts, Between the Woods and the Water and The Broken Road. Sir Patrick died in 2011 at the age of 96 and is regarded as a central figure in 20th century cultural life. That is reflected in the archive which includes correspondence from many famous names including Gore Vidal, Truman Capote, Iris Murdoch, Lawrence Durrell, Bruce Chatwin, Cyril Connolly, the Duchess of Devonshire, Prince Charles and Sir Patrick’s publisher John Murray. One of the many unexpected items to be found in the archive is what appears to be an unpublished handwritten Sir John Betjeman poem, literally written on the back of an envelope. Cataloguing the archive has taken a year and it has revealed a much larger number of correspondents than were expected – over 1000 – along with thousands more photographs. The Library is working on digitising major elements of the archive which will be made available through its website. Plans are also being considered for staging exhibitions and displays of the material to reach as wide an audience as possible. A major element of the archive is Sir Patrick’s war years which saw him organise guerrilla operations in Crete against the occupying Nazis. He spent much of this time disguised as a Cretan shepherd, living in freezing mountains caves. In 1944 he organised one of the most daring feats of the war when he led the team that kidnapped the commander of the German garrison on Crete. This was made into a film Ill Met by Moonlight in 1957 starring Dirk Bogarde and the story was told by Sir Patrick in the recently published memoir Abducting a General. The archive was presented to the National Library by the John R Murray Charitable Trust which also supported the cataloguing work. Sir Patrick’s books were published by the Murray family. This entry was posted in Uncategorized on November 18, 2014 by proverbs6to10. Great work Tom , keep it going. It’s interesting to note Truman Capote was a correspondent of P.L.F. I wonder where they met? I’d love to have listened in to a conversation between the two.